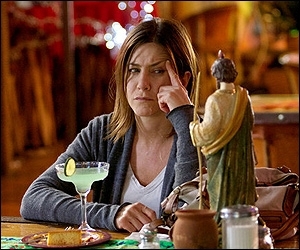 CAKE gives Jennifer Aniston a showcase for her considerable dramatic skills, and made for a (temporary?) escape valve from a long run of comedies that poorly utilized her talents in that direction. It was also possibly her best chance at an Oscar nomination, but she was shut out. She’s good, the 2014 movie is soso. 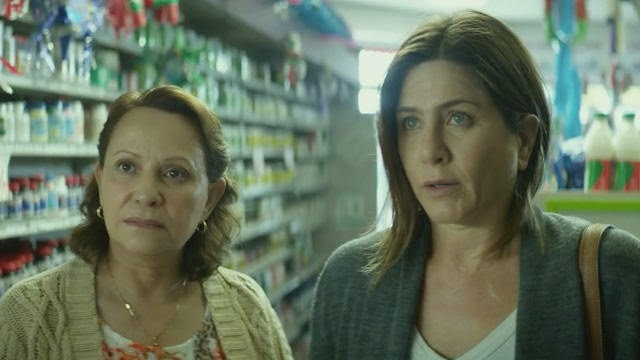 Script has Aniston as the drugged-out, emotion-deadened survivor of a terrible accident, one that killed her child and left her with a scarred face and body, wracked with pain, physical and psychological. The tone is uneven; first half is interesting, the second crawls, and gets to an “okay, whatever” finale. No back story, little to like about her character beyond the actresses skill (she does some great physical work here). Hampered by a brief and not believable subplot involving a snotty runaway (Britt Robertson), a poorly developed main subplot with Sam Worthington as another sufferer (wife killed herself—itself yet another distracting device, with Anna Kendrick). Co-main-subplot with housekeeper Adriana Barraza goes nowhere (although she’s fine)—have we mentioned subplots? Directed by Daniel Barnz, lasting 102 minutes, the low-budget indie ($8,500,000–low-budget with a major actress, anyway) didn’t find an audience, bringing back less than a quarter of its outlay. Critics were kind to the actress, less so to the film. Felicity Huffman has a few good moments, and William H. Macy shows up briefly. With Chris Messina, Mamie Gummer.